Canadian Sport Institute Pacific (CSI Pacific), in partnership with the national network of Canadian Sport Centre and the British Columbia network of PacificSport Centres, delivers sport performance programs and services to provide athletes and coaches living in BC with every advantage to win medals for Canada. Through community partnerships with local businesses and municipalities, Registered Athletes receive access to a variety of programs and services. For more information see the following links or contact our Sport Performance Program Coordinator. Wondering if you are Eligible to Register with PacificSport? 1. By their Provincial Sport Organization (PSO). The PSO should notify the athletes by letter or email, stating that they have met their sport specific criteria and are eligible to register with CSI Pacific/PacificSport. 2. By Sport Canada. 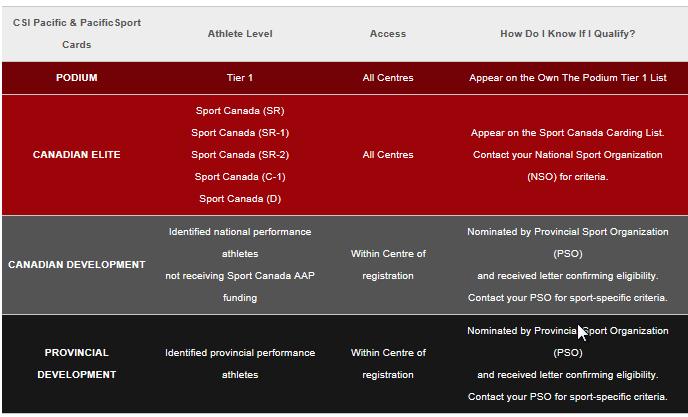 If an athlete is receiving Sport Canada Athlete Assistance Program Government Funding (usually this means an athlete is a Canadian National Team Member), then the athlete is immediately eligible to register with PacificSport Okanagan. Before receiving your initial Athlete card, or renewing your existing Athlete card, you must submit contact the Sport Performance Program Coordinator. The programs and services provided to Registered Athletes are aimed at covering many aspects of life both inside and outside sport, attempting to ensure holistic development. For more information on any of our Registered Athlete services please contact our Sport Performance Program Coordinator. PacificSport Okanagan recognizes the need for financial aid to support the competition needs of high performance athletes from the Okanagan. In response to that need, the Athlete Travel Grant has been established to assist individual competitors or teams with the travel-related expenses associated with participating in high-level sporting events. For eligibility criteria and application details please refer to the Athlete Travel Grant application form. ► Report Form - Fall 2018 / Winter 2019 - NOW OPEN! Deadline to submit: April 30, 2019. ► Spring / Summer 2019 Application Form - NOW OPEN! Application for event dates that fall between April 1, 2019 - September 30, 2019. ► Report Form - Spring / Summer 2019 - NOW OPEN! Deadline to submit: October 30, 2019. The Athletic Excellence Grant has been established to assist high performance athletes or teams with the travel-related expenses associated with participating in high-level sporting events such as provincial or national championships. For eligibility criteria and application details, please refer to the Athletic Excellence Grant application form. Together BC Ferries and viaSport BC offer a financial assistance program that aims to offset the cost of athletes traveling to and from competitions by ferry. To be eligible for the program, applicants must be competing in a sport that is a member organization of Sport BC. For eligibility criteria and application details, please visit their website. CAN Fund is a financial assistance program available to active national team athletes training to represent Canada internationally. It provides direct funding to athletes, creating the opportunity to focus on success instead of on unnecessary financial hurdles, such as training, coaching, and nutrition fees. To learn more about CAN Fund, please visit their website. Athletes CAN, in partnership with the Investors Group, award twenty Canadian amateur athletes with the Team Investors Group Amateur Athletes Fund each year. The $5,000 bursary is available to senior national team athletes based on selection criteria including athletic achievement, financial need and community involvement. To learn more about this bursary, please visit their website. For more information contact our Sport Performance Program Coordinator.